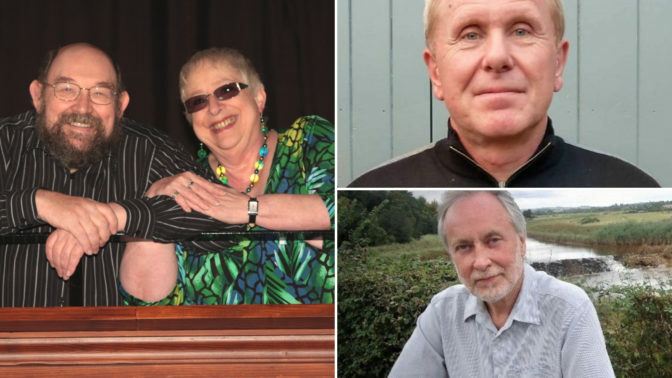 A weekend of song-sharing and workshops with Tom & Barbara Brown, and guest leaders Mick Ryan and Lester Simpson! Singers of all ages (teenagers to pensioners) and abilities are welcome to join the fun, in the comfortable and relaxed surroundings of Halsway Manor. Big Sings (with everyone having a chance to lead chorus songs – if they want to) when the bar is open, and opportunities to explore songs and individual singing in between, or have a ramble around the glorious countryside – it’s up to you! You’re welcome to bring accompanying instruments if you wish. The extensive folk library will also be open throughout the weekend should you wish to delve into the collection. The weekend concludes after a twilight ‘Leaders’ Concert’ on the Sunday evening, but optional supper, B&B is available should you wish to stay on for Sunday night’s survivors’ session. This is a friendly weekend is for singers of all ages and abilities to enjoy and explore traditional song in a convivial and supportive atmosphere, with opportunities to learn how to look after and improve your voice and performance. Tom & Barbara Brown: Grounded in the living tradition of singing in the West Country, these two have a long history of encouraging and enthusing amateur and new performers to share songs and singing, and creating a relaxed and friendly atmosphere in which to do it. Lester Simpson: As one third of ‘Coope Boyes and Simpson’, one fifth (or sixth!) of ‘Coope, Boyes, Simpson, Freya and Fraser’, and one quarter of Narthen, there are few singers with a greater skill and repertoire in traditional harmony singing. He’s joining the team to offer singing workshops to help you get the most from your voice. Mick Ryan is well known on the folk scene as a fine singer of traditional and original songs, and was described by “Folk Roots” as ‘definitely the most underrated singer in the country.’ Having written both comic and serious material for the very popular band Crows in the 1980’s, he has since written for radio and a series of highly successful folk musicals: ‘A Tollpuddle Man’ (with Graham Moore); ‘A Day’s Work’; ‘The Voyage’; ‘Tanks for the Memory’ and, recently, ‘The Navvy’s Wife.’ Who better to lead the songwriting element of the weekend? !